This installment of the Advanced Adventures-series clocks in at 21 pages, 1 page front/back cover, 1 page editorial/ToC, 1 page advertisement, 1 page SRD, leaving us with 17 pages of content, so let’s take a look! As always for this series, the default rules-system is OSRIC, and the presentation is perfectly in line with the nostalgic 1e style, down to the font. This is an old-school adventure, and as such, you should not expect much read-aloud text beyond the introduction. The cartography included within is functional, but does not include player-friendly maps. Cartography is serviceable. This module is, nominally, intended for 60 levels of PCs, so for PCs level 10 – 14. Officially. Unfortunately, much like the author’s last offering, this very much showcases that this module has not been playtested. This is an adventure more suitable for characters nearing or already at the apex of their power, and even then it is a meat-grinder with a boss that will make some of the deities as statted up in the classics weep. Thematically, this goes as similar route as “The Lost pyramid of Imhotep”, and while I personally could derive some joy from said super-deadly meat-grinder of a module, this one does lack the angle of precise research acting as a contextualization. But to discuss this further, I need to go into SPOILER territory. Players should jump ahead to the conclusion. All right, only GMs around? Great, so the White Worm is basically spreading winter from its icy fortress, the PCs should slay it, and on the way there, there’s a tomb where they can find a sword that will help with this endeavor. The premise is simple and offers some interesting angles; for example, the tomb that contains the legendary sword is the tomb/testing ground of one Harald Hardada[sic! ], echoing obviously King Harald III of Norway, Harald Hardrada. In the iteration presented within, said mythical being was actually a frost giant, with all that entails. Indeed, while PAINFULLY linear, I can suspend my agenda for the purpose of the testing ground angle that the cairn of said being, and first, completely optional, dungeon operates under. But I’m getting ahead of myself. The trek towards the fortress of the white worm is handled with a mini-hexcrawl, and the longer the PCs take, the more spellcasting prowess their already super-potent enemy will have accumulated. The random encounters provided for the short trip are solid, if not particularly remarkable – yetis, winterwolves, frost giants, white dragons. Pretty much classic ice monsters. Without magic aid, the frigid cold will cause HP loss, which is a nice angle. The PCs will have to fight their way through a gated pass, and hopefully, they will check out the optional dungeon. Why? Because Harald Hardada[sic! ]’s dungeon is one where the author plays to his strengths: There is a logic to the challenges, deadly though they may be, and making a mythic hero a literal giant is a creative tweak that allows for some interesting changes to the logic of riddles and the like. When these work, then they do so with the same enjoyable effects as in e.g. “The Lost Pyramid of Imhotep”; when they don’t, however, then they come off as deliberate and nasty screwjobs. This is not only a super-linear dungeon in the way in which the rooms are aligned, it is also super-linear regarding solutions. Open the false door (no clues available) and you’ll be prismatic spray’d. In one room, failure to have a fire-based spell ready prevents getting further. All of these traps and the like are per se creative and interesting, if a bit sadistic. However, here’s the issue: There is pretty much no way for even mythologically-versed players to navigate these. Player skill does not really matter that much, and since the angle combines the myth of Harald (which does not help navigating the dungeon, fyi), Norse lore and frost giants, players are reduced to educated guesses in quite a few of these instances. I never thought I’d write this, but “The Lost Pyramid of Imhotep” feels positively fair in comparison. And then there would be the main dungeon, a citadel carved into an iceberg, where the white worm lairs. Amazing set-up, right? Well, alas, it kinda lacks a distinct identity. Fire and ice, one could say, due to e.g. hell hounds, red dragons and the ice monsters you’d anticipate, but that’s about it. There are demons. The obligatory and tired mirror of life-trapping. The room where no less than 6 magic users wait to unload on the group. The traps and general sense of identity here feel distinctly magical, but not in the most interesting sense, and, as mentioned before, the final boss is basically on a deity’s level: AC -2, 6d8 damage (plus paralysis), breath weapon, constriction and both cleric and magic-user spell array. And over 200 hp. If there has ever been a boss where even killer-GM ole’ me has said “That’s overkill”, this would be it. If someone, ANYONE out there has killed this thing sans GM-fiat or ridiculous custom damage magic items that deal a crapton of bonus damage, let me know. Unless, by some miraculous event, my math skills have taken a serious nosedive, the chance to defeat this thing, even f the PCs and players do everything right, are next to nil. And before you ask: That super-sword, the dungeon of which probably has cost at least one or two PCs their lies? It’s actually pretty underwhelming regarding its abilities to best this monstrosity. Editing and formatting are good on a formal and rules-language level. Layout adheres to a two-column b/w-standard with nice b/w-artworks. The pdf comes fully bookmarked and the cartography is functional, but does not include player-friendly versions. Alphonso Warden’s modules so far have been a mixed bag for me; on the one hand, there is a definite fascination that “The Lost Pyramid of Imhotep” managed to evoke, and I do like some of the creative traps. However, this does not change that, this module, alas, more so than the last, is frickin’ unfair in a bad way. 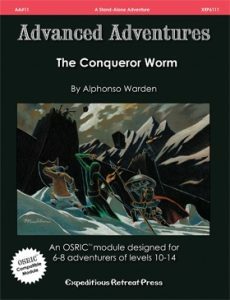 Player agenda and skill do not matter that much, and the linearity of how this is supposed to work and solved, while not as pronounced as in previous adventures, lacks, much like the traps, a context that at least makes it possible for the players to deduce how this is supposed to be solved. More often than not, this comes down to luck and the roll of the dice, not to being clever. And then there is the horribly out of whack difficulty. I’m not a GM who wants “level-appropriate challenges”; I throw dragons at 1st level PCs and expect them to run like crazy, grovel, etc. I have no problem TPKing my groups. But that type of thing must be EARNED and not subject to Gm fiat, to an adventure allowing only the author’s logic to persist. Unlike the lost pyramid, this lacks the mythology as a guiding principle, as an extensive, externalized hint-catalogue, and thus becomes, much as it pains me to say, an exercise in frustration. I so hope that the author would bring the same level of expertise and creativity regarding puzzles etc. to Norse myth in this one; instead, we unfortunately get a woefully unfair adventure that I would not inflict on any group. It’s not as bad as the atrociously-boring “The Prison of Meneptah”, but it’s close. My final verdict will be 1.5 stars, rounded up due to in dubio pro reo.